This is clean eating at its best. Salmon zoodles with kale pesto and feta. The zoodles can even be eaten raw in summer for a cool salad, or gently steam them for a quick winter warm salad. 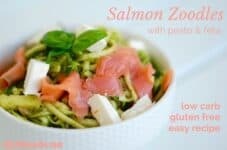 If you have been living under a rock and have never heard of zoodles, you need to read this post to see how incredibly easy and healthy they are compared to pasta or noodles. 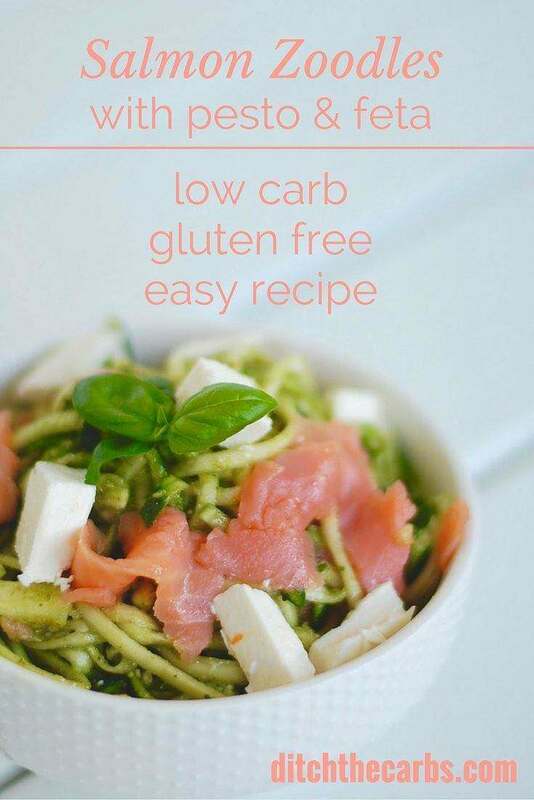 Salmon zoodles with pesto and feta is an incredibly simple ‘throw it all together’ kinda meal. Simply put, zoodles are the low carb equivalent of noodles, only made with zucchini. They can be eaten raw or steamed to gently warm them through. The only time consuming part of this recipe is to make the zoodles, especially if you have already made my kale pesto and have it sitting in the freezer (you know I love my freezer). If you haven’t made my kale pesto yet, or don’t have any to hand, you can easily substitute store bought pesto, just make sure it is made with olive oil and not canola or generic ‘vegetable oil’. If you want to see which oils I keep in my pantry or fridge, take a look here. This is a classic low-carb dish. 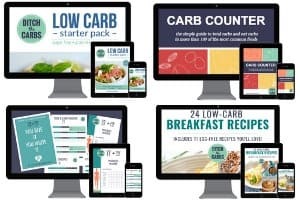 It sums up all that is good, fresh and vibrant about low carb. 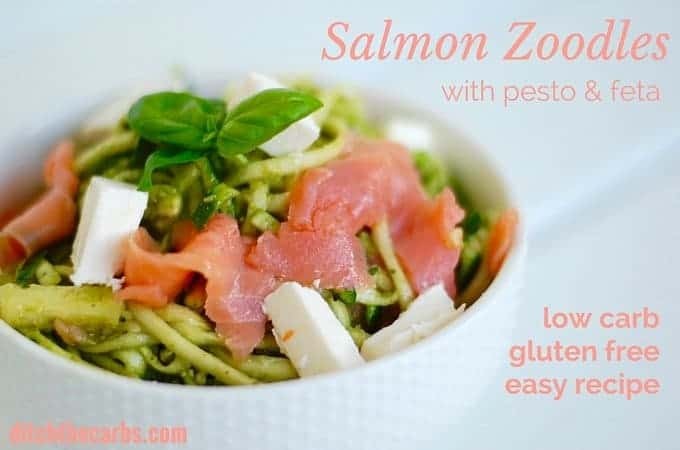 Salmon zoodles with kale pesto is quick and easy, and packed with nutrition. 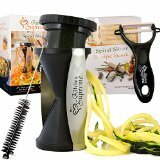 Prepare the courgettes/zucchini by using your spiraliser. Steam gently if you would like a warm salmon zoodle salad. Gently stir through the kale pesto, feta and salmon. Serve in individual bowls and squeeze some lemon juice over each bowl (optional). The sugar will be less if steamed, as much of the sugar is lost in the water. As someone who really doesn’t like zucchini, what other vegetables could you suggest for spiralizing? Carrots, pumpkin, butternut squash, beetroot, broccoli stalks …. Some of these are higher in carbs but are a great alternative to wheat pasta. Just got a spiraliser so made this as my first attempt at zoodles. Easy, tasty and yum. I used a small can of salmon as it’s what I had. Just lovely. Another one to add to the regulars I think. Such a nice and fresh dish and very easy to make. I’m keeping to a max of 20g carbs per day and this recipe is slightly higher in carbs then what I’d usually make but I found that it wasn’t anywhere near as filling as most other low carb meals I have. Usually I only need a tiny bit to fill me up but I found myself needing more than a serving for this one, would some extra fat added help? Maybe a bit of cream in the pesto? Yes adding more healthy fat would be a good way to fill you up with this recipe. Drizzle with plenty of olive oil or avocado oil, add avocados, more feta, more salmon etc would all do the trick. Made this for lunch today – totally worthy of Sunday dinner status! Added 3 grape tomatoes & 4 kalamata olives – molto bene! I’ve always found zoodles really watery so I bake them now, they’re really delicious and you can add parmesan or whatever. Yummy! Being family friendly is my guiding principle, I always cook the same meal for my entire family. Thank you for such a lovely comment. I bet this really taste great! Yum! The Amazon links are at the bottom of the post. I love ‘zoodles’.! !..had some tonight as my family had noodles (topped with w/my tomato basil sauce and fresh Parmesan ), I had zoodles. I make enough for one, then microwave them for a few minutes – not covered, just on a microwavable plate, put on any type of sauce you wish – YUMMMMY!